Those magnificent men in their flying machines – and a(nother) sunset #narrowboat #England #offgrid – The Diesel-Electric Elephant Company. Why watch television when you can watch the sky? I don’t mean ‘…watch the sky…’ in some “X Files” way, I mean just simply watch it. You couldn’t pay to have a show such as this one put on, and yet it’s all there for free. Just before dusk today I rolled myself out of my slightly damp, slightly musty-smelling hammock and manoeuvred myself into a stood standing position on the Cardinal’s quarter-deck. The effort was …rewarded. 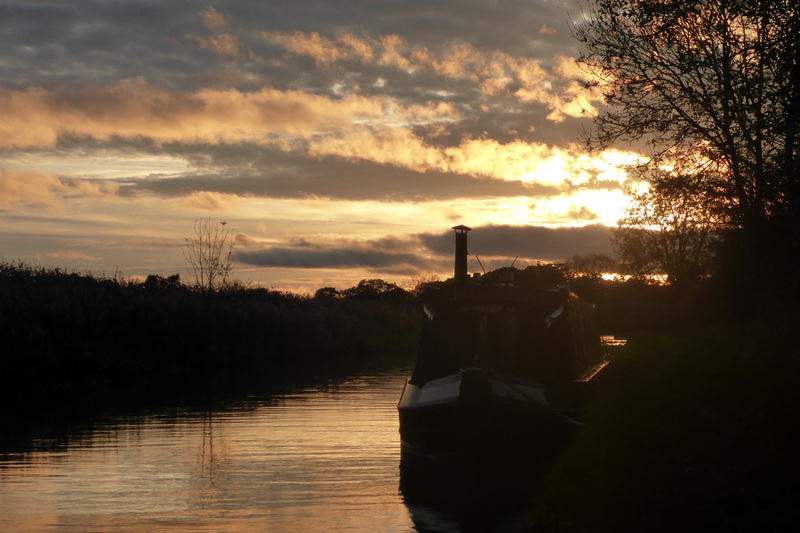 Sunset in October over Bridge 4, Middlewich Branch, Shropshire Union Canal. Bridge 4 is in there, it’s just buried in that shadow. Our local star was – well, I was about to say ‘dipping under the horizon’ but in this day and age there are, like as not, folk having been “educated” in modern schools out there who would take me literally and be comfortable in the notion that the Sun revolves around the Earth, so I’ll just say ‘our local star was setting’. After all, everyone knows that the sky is just a huge LED screen upon which the Lizard People of Buckingham Palace project their thoughts in order to control our diminutive human minds. For a short spell some evenings it is virtually impossible to avoid pointing the camera at some splendid detail. It didn’t matter how I framed it; ’twas gorgeous from any angle. Some bits were akin to vapours of pure gold released into the sky, other bits were softer, fluffier, darker, with more of the smoke and ochre about them. What was it that someone, somewhere once said? When I die I want to go peacefully in my sleep, not screaming in terror like an Air-Zimbabwe economy-class passenger. During Round Two I was reminded of a certain song in re MacArthur Park, although why I do not know, since this icing was white, not green, and I have no idea whether it was sweet. It wasn’t raining either, and now I am hungry for cake, but have none on the boat. Is it icing, do you think, or is it that candlewick window-dressing that Great-Aunt Dave used to have over the top of the windows to help shade his boudoir? Perhaps engine No.4 was misfiring? You can tell, can’t you, that I do not possess (and do not want, will not have) a television aboard the Cardinal (or indeed, anywhere else)? I had a busy morning this morning. Sainsbury’s had called, explaining that they had a surfeit of grocery stock and asking could they please drop some off for me. We had arranged to meet in the horseless-carriage park of the local marina. Well, not being born yesterday, I allowed half an hour in advance and would have been prepared for half an hour in arrears, but the moment I eased my ample gluteus maximus off the Cardinal and pointed my trolley in the direction of the rendezvous, the “telephonium mobilis” received its first signal of the day. An “answerphone” message. Could they please deliver early? When, asks I. Now, came the reply. I advised them that time, space, the laws of physics and my knees being what they are, there would be a ten minute wait before we could share co-ordinates. Suffice it to say that groceries and I were wholly back aboard the Cardinal some four minutes before my delivery time-slot even began. This including the ten-minute shamble to meet the driver and the fifteen-minute slog dragging my comestible-laden trolley back along the soggy, uneven towpath*. The driver, a jolly chap with well-turned ankles and two left ears, explained that he was attempting to “make up time” because his next delivery was of some fifty pumpkins (and the drivers get a mere five-minute “allowance” in which to complete their deliveries, which I calculate to be some six seconds per pumpkin, not including parking, turning off the van’s engine and getting the recipient to sign for the goods). Pumpkins, eh? I suspect that there may be persons of a trans-Atlantic, ex-colonial nature in the area. Pumpkins are very popular with tax defaulters, apparently. So much for a lot of the morning. I had a busy afternoon, too. I began reading one of C.S.’s Hornblower books. Captains and Admirals in peril on the sea, that sort of thing. Most splendid. It’s very engaging, so I may read it late into the night, retiring in my nightshirt to my cabin, and I probably won’t, therefore, be up and about in time to see if there’s a decent sunrise tomorrow. If I’ve got the science right – and there’s no guarantee that I have – then if there is one it will probably take place in the portion of the sky vaguely opposite to tonight’s sunset. Damn, this science is clever stuff. I wonder if the pilots into and out of Manchester Airport play noughts and crosses overnight, as well as during the day? I may nip outside with the torch later, just to check. I know that the sight of me in a nightshirt scares the wildlife, but I have become curious. The owls, badgers and whatever else is out there will just have to scream, if scream they feel that they need to. They can’t all be terrified of the sight of a well-developed man in his prime, surely? Right, a spot more Hornblower and a pint of rum before bed. Thank you! The Hornblowers are excellent books, aren’t they? A whole world to dive into and experience. You’re right too about the water – even the canal water has its many moods, from millpond shiny to a hundred different sorts of (small) waves, all fascinating to watch. But… but… I haven’t mentioned the livestock in the hammock, or the … stains… 😉 The aeroplanes crossing each other’s path in the sky always worry me, I am never wholly convinced that there’s enough separation! We do enjoy a pumpkin season over here. It’s nearly mania. But being rather pleased with the orange squash I don’t find it taxing. Still 50 pumpkins is something over the top unless they are planning to re-sell them? But do you get your best wholesale price from the grocery. Seems like bad business. I feel the thing needs investigating. You need to switch genres and start reading Poirot and Marple. Something is afoot with the pumpkins. Too many. Far too many. Fifty pumpkins is indeed suspicious. The Pumpkin Murders… That said, I have no idea who one might kill a person with a pumpkin. Drop one on them from a great height, perhaps? Shove it on their head and smother them with it? We would need Poirot and Marple head to head to solve such cases…. Ah, magnifique! You didn’t mention the rabbit in the third pic down, must be one of the sky rabbits! I have a long history of reading skies, and I agree they are very entertaining. Curiously the planes are significant as sitting in my own bunk (as I do most nights writing) with the blinds open I have a wonderful view of the flight path in and out of East Midlands airport. The planes fly over my house, bank to the right and descend into whatever number the runway is. Of course on a good full moonlit night at certain times in the year they pass across the moon coming in. I often wish I could take photos like yours for the very reason that some are such wonderful colours. Icing maybe, but reminds me of that edging they used to put around lamp shades at the bottom. Did you have to mention CAKE!? Arrgh, tis the icing on the solar panels that annoys me, me hearties. Swans and geese generally stay clear, but ducks can produce more than their own bodyweight in poop, twice daily! Hmm… cake.